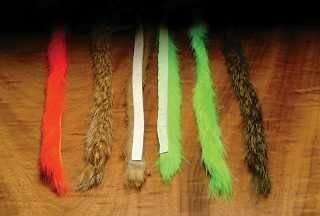 1/4in wide strips make these ideal for making larger pike and saltwater patterns. 1/4" Magnum Rabbit Zonker Strips Black. 1/4" Magnum Rabbit Zonker Strips Brown Olive. 1/4" Magnum Rabbit Zonker Strips Chartruese. 1/4" Magnum Rabbit Zonker Strips Claret. 1/4" Magnum Rabbit Zonker Strips Flo. Fuchsia. 1/4" Magnum Rabbit Zonker Strips Flo. Hot Pink. 1/4" Magnum Rabbit Zonker Strips Golden Olive. 1/4" Magnum Rabbit Zonker Strips Grey. 1/4" Magnum Rabbit Zonker Strips Hot Orange. 1/4" Magnum Rabbit Zonker Strips Natural Brown. 1/4" Magnum Rabbit Zonker Strips Natural Grey/Chinchilla. 1/4" Magnum Rabbit Zonker Strips Natural Light Brown.